Crashes are today's version of "the dog ate my homework." However, this excuse has quickly gone from being a common fixture in schools and businesses, alike, to being socially unacceptable for the most part. If I were a gambling woman, I'd bet my lunch money that this shift is largely due to the rise of cloud services and Software-as-a-Service (SaaS) applications, which store your data safely in remote systems and can't be impacted by a computer crash. Today, we live in a "now" culture. The people we interact with and the clients we serve don't just want on-demand, uninterrupted and reliable access, data, files, productivity and customer service — they expect it. If crashes and resulting system downtime prevent you from supplying what they want and expect, many will not hesitate to take their business elsewhere. And, you can bet that, more often than not, there's a competitor waiting in the wings with the right, working technology to give them what they want and expect "now." You see, the real added risk here is the lost time, revenue and trust that come along with crashes and system downtime. So, is the money that you think you're saving by using old tech still worth it? Oh and, by the way, if you do think you're saving money by putting off that system upgrade, be sure to read Risk #2: Increased costs. Put simply: outdated technology can be expensive to maintain. It's really not much different than maintaining a very old home or vehicle, except that technology ages at a much faster rate. In fact, according to the infographic, it costs nearly double to fix a system that is four or more years old. For example, CNN Money reported that the US Navy could pay Microsoft up to $31million to maintain their now-defunct operating system, Windows XP. Why? When the OS was discontinued, Microsoft stopped actively developing security updates and patches for it, even as new major flaws and security holes within the system have been discovered and exploited. Yet, the Navy desired the option to maintain its legacy systems, so, Microsoft pretty much had carte blanche to name its number. If you moved to a notoriously dangerous neighborhood, removed the alarm system and locks, and left the doors and windows wide open, wouldn't you expect to pay a high premium to keep your now-vulnerable home safe? Using old technology systems is no different and can be extremely costly to maintain. And, that's before you consider the cost of employee time spent fixing old tech and making it work, rather than being productive and focusing on the real business tasks at hand. No one likes to feel like they don't have the right tools to succeed, so keeping antiquated technology in your business can also negatively impact your employee satisfaction and morale. Low employee satisfaction and morale usually equate to high turnover, so you could expect additional costs for recruitment, hiring and training new staff, as well — all thanks to that old tech. Plus, most older technology uses much more power than newer energy-efficient versions, creating unnecessary extra overhead costs for your business. 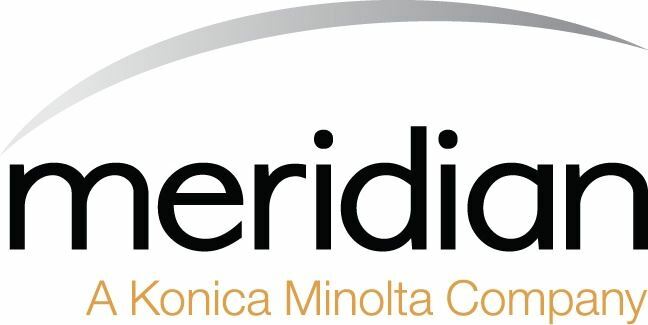 For example, check out Konica Minolta's eco Calculator to calculate the potential reduction in energy costs that you could achieve by upgrading your old office systems. So, where is your money best spent — maintaining antiquated systems, or driving new business value? Let's return to some of the moments I mentioned in this blog's intro, shall we? The rotating hourglass. The spinning rainbow ball. The delay between typing at an average pace and characters actually appearing on your screen. The constant string of pop-up notifications, your devices begging for this update or that patch. The "start-up disk full" notification appears, right before your computer freezes. You furiously swirl your mouse around on your desk, but the pointer on the screen doesn't budge. What do all of these moments have in common — aside from making you go a little crazy? The common thread is time. They all take up valuable time, which could be better spent being productive. Old technology runs slower, takes longer to execute tasks, and requires much more time-consuming maintenance, patches, updates and helpdesk calls than its newer counterparts. In fact, Microsoft estimates that SMBs who use old PCs could lose up to seven days per calendar year — what could your business do with an extra week each year? Even if you don't consider your PC to be old yet, computers that are more than 4 years old cost 21 hours of productivity due to repairs, maintenance, updates and critical security fixes. Decreased productivity can cost your business in terms of both revenue and ROI — you get a lot more out of productive employees than those who spend portions of their day just trying to get their tools to work properly. Not to mention the cost of satisfaction and retention, for both employees and customers. A great option to minimize the risk associated with hardware updates is Hardware-as-a-Service (HaaS), which some hardware and managed services providers (like Meridian!) provide. HaaS essentially gives you the flexibility of leasing for hardware that would traditionally have to be purchased outright. So, a major benefit of HaaS is that you pay a reasonable, monthly fee, instead of a large, upfront capital expenditure. Other popular HaaS benefits include the opportunity to upgrade much earlier, minimizing the risk of spending a lot on something that ages quickly, and the ability scale as your needs grow and change. Using old technology can open your business up to a world countless, constantly increasing security vulnerabilities. 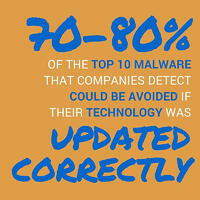 In fact, research shows that over 10,000 new malware threats are discovered each hour. If your technology is not always up to date, your risk is constantly increasing at exponential rates. If you are running Windows XP on your computer, you are 6x more likely to be infected with malware threats than if you are running Windows 10. For those still using Windows Server 2003, which reached its end-of-support on July 14, 2015, means you will be at greater risk of cyberattacks and exploitation by third parties. Microsoft Office 2003 also reached end-of-support in April 2014, meaning there will no longer be critical security updates. Even though Office is just your basic productivity tool suite (Word, Excel, PowerPoint, Outlook) and may seem unrelated to overall system security, it can still open vulnerabilities to your whole network. 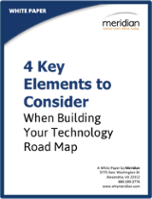 The best way to ensure you always stay up to date is through documentation of what you have and how often it must be upgraded, such as a Technology Roadmap, and a solid set of maintenance and update processes. Auditors can fine companies that don't transition from unsupported software or systems. Plus, outdated systems can make you a prime target for cyber-attacks and potential data breaches, which can have catastrophic consequences for your business. Small-to-midsize businesses (SMBs) can no longer assume that they are too small or unimportant for hackers and cyber thieves to target. Criminal enterprises consider many types of SMBs, such as medical practices, law offices, engineering firms, and educational institutions to be low risk, high reward targets holding valuable personal identifying information (PII) about their clients. SMBs also tend to be the most lax about updating their technology, dramatically increasing their vulnerability and attractiveness to cyber-criminals. Just because you are not a law or healthcare firm does not mean you're immune to legal and regulatory compliance risks. There are many compliance requirements that apply to any and all companies that handle employee data and even payment card information related to your business transactions. Using old technology exacerbates existing compliance risks that you may not even be aware of. Consult with an MSP for a full assessment of your systems and an evaluation of any applicable regulatory compliance issues.